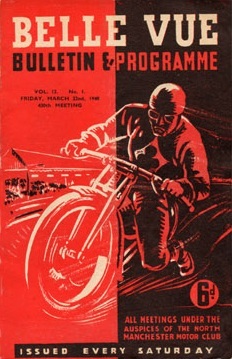 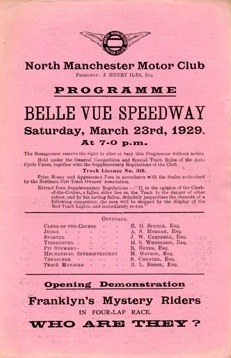 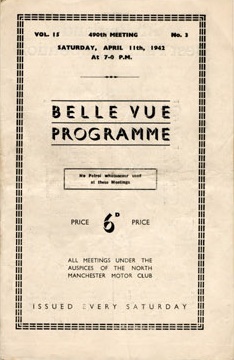 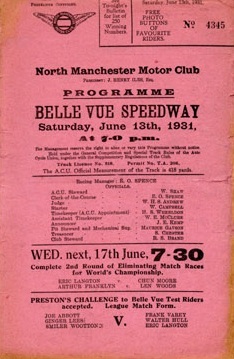 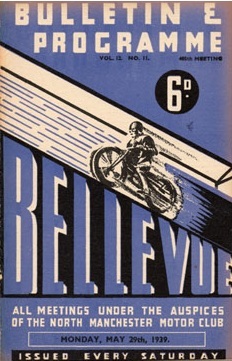 Belle Vue is steeped in history and opened its doors to dirt track speedway for the first time on 28th July 1928 in the Gorton area of Manchester. 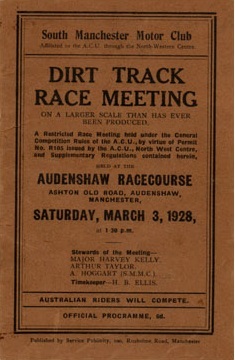 However, on the 3rd March 1928 a meeting was held on the Old Ashton Road in Audenshaw, Manchester, and the programme for it is shown below. 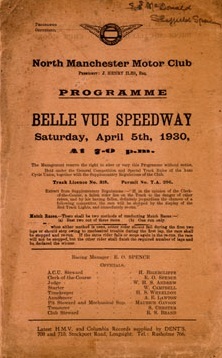 The Golden Helmet in that initial meeting was won by Frank Arthur. 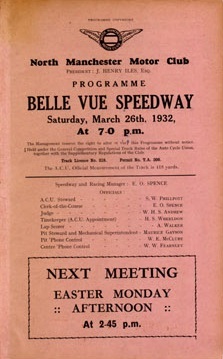 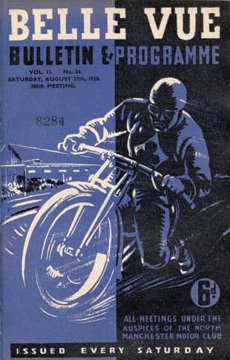 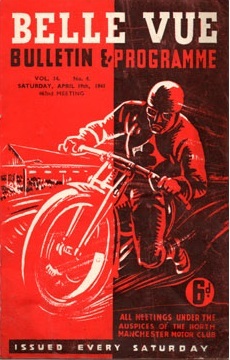 At the Zoological Gardens, Grass Track racing took place for the first time on 1st October 1927, with an International meeting being held on 25th February 1928. 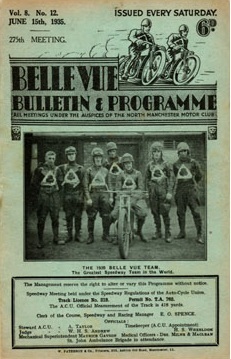 They have been League Champions on numerous occasions, firstly in 1930 and more recently in 1983. 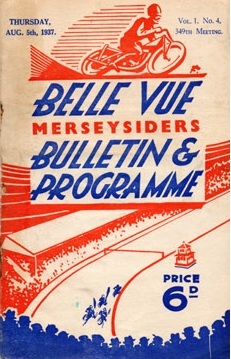 They have also won the National trophy on 9 occasions. 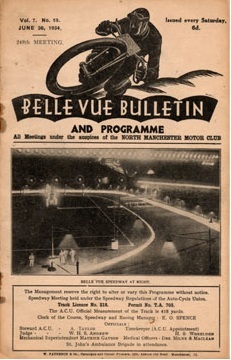 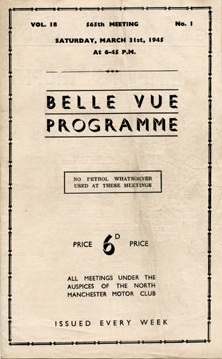 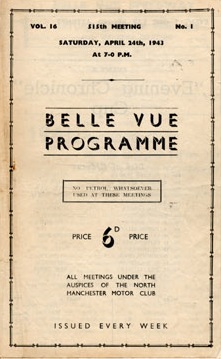 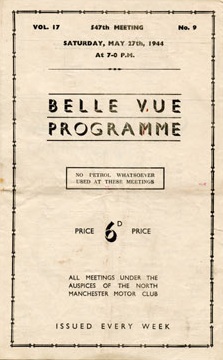 The first greyhound track to open in England was at Belle Vue, situated in the Gorton area of Manchester, when racing took place on 24th July 1926. 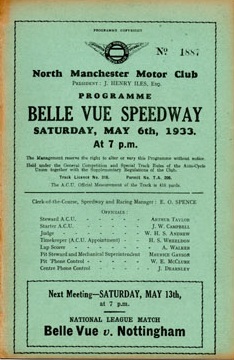 Whilst the first meeting was well attended by a crowd in excess of 1700 people, interest quickly grew and crowds could be numbered in the thousands. 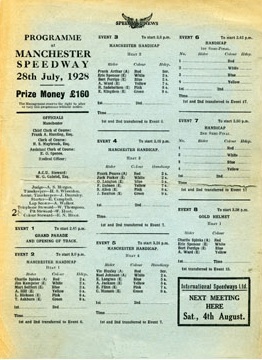 The very first race to be run in England was won by Trap 1 Mistley. 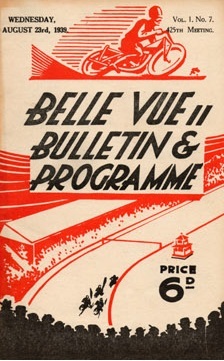 The Cesarewitch was run over 880 yards at Belle Vue for the first time in 1971. 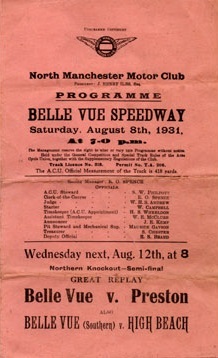 Throughout its history the team have been known as ther Aces, although their amateur team were the Colts, and their reserve team were the Goats. 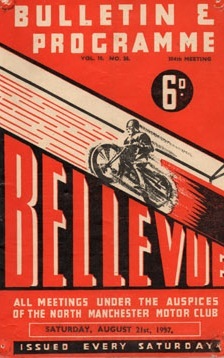 The Belle Vue Aces currently (2019) contest the SGB Premiership. 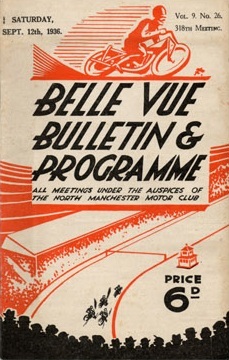 Recent successes include the Premier League Knock-out Cup in 2017 and the Elite League Knock-out cup in 2005.